“What I like about Faith Journeys is that they know how to listen and they know when to make suggestions. The four of us guides are seasoned travelers and love to customize our trips. They work with us well so our trips aren’t ‘cookie cutter!’ They know what will work and what won’t and are extremely helpful in all aspects of planning a trip. We limit our groups to forty-four people and have many return customers. 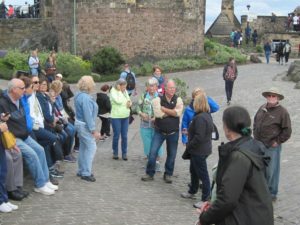 Many of them are younger than the average age of group travelers and Faith Journeys understands us when we want to pack many activities into the days, stay in places where after hours attractions are available, and find us city guides who really know their stuff and aren’t afraid to walk us around. « First Presbyterian Church from Lancaster, Pennsylvania experience the best of Ireland and Scotland!